There are no easy answers for burly Wolfenstein protagonist B.J. Blazkowicz, as the objects of his rhetorical ire come goose-stepping through the windows and doors with murderous intent. But it’s not very clear whether he thinks there are too many Nazis or too few. Because if there’s one thing this guy was placed on the earth to do, it’s putting Hitler’s pawns in the ground. And if the world has no more Nazis, does it still need B.J. Blazkowicz? Wolfenstein: The Old Blood is a prequel to 2014’s Wolfenstein: The New Order. The year is 1946, and thanks to a stunning technological leap, the German army has the Allies on the cusp of defeat. As the game begins, Blazkowicz and a suitably expendable buddy are tasked with infiltrating Castle Wolfenstein and securing vital intelligence. These documents are held in the hateful, arthritic claws of a Nazi crone called Helga. She is intent on marshaling occult Teutonic forces to vanquish American freedom once and for all. Your infiltration mission is exposed almost immediately, and Blazkowicz soon finds himself in a windowless pit where his only friend is an inanimate metal pipe. (In a situation eerily similar to Homer Simpson’s journey into space, this unremarkable piece of corroded metal, in many ways, becomes the true hero of the story.) The Nazis may boast advanced military technology and ancient Visigoth sorcery, but these trifles are clearly no match for a dash of Yankee know-how and a bit of multi-purpose tooled iron. The Old Blood is presented as a prequel, notionally a way for fans of The New Order to more fully inhabit the waning days of a less-than-ideal World War II scenario that might have been. If building out the world’s mythology is indeed the reason for this game’s existence, does it succeed? Does The Old Blood add to the surprisingly intricate story of its immediate predecessor in any meaningful way? Or is it just adding more Nazis to the world for B.J. to massacre? It’s not like killing Nazis in this eight-chapter campaign is any less satisfying than it is in The New Order. An expanded arsenal (including the Swiss Army Pipe), some freshly guttural enemies, and other supernatural wrinkles make for a frenetic and gleeful revenge fantasy. But potato-masher garnish aside, there isn’t really too much here that you can’t already get in The New Order. 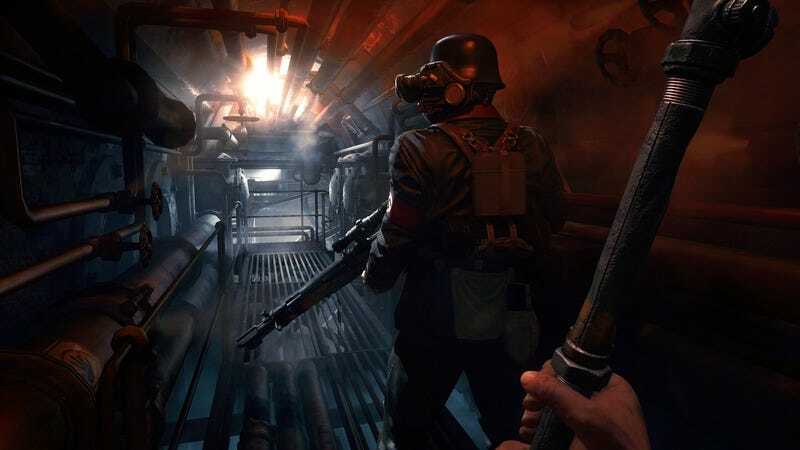 One other problem might be that The Old Blood tries a little too hard to bridge the gap between the original Wolfenstein games and the new. With touches like the grindhouse-flavored title screen, The Old Blood feels like it wants to take a step back from the things that made The New Order a success and instead opt for an homage to the drop-ceiling hell of Wolfenstein 3D. I loved Tim Burton’s version of Batman too, but it would be a mistake to give him the keys to Gotham in 2015. Sometimes it’s okay to leave the past in the past. That’s not to say The Old Blood doesn’t have its moments. In one memorable instance, B.J. finds a shotgun and a conveniently placed hacksaw. He begins sawing through the barrel (as any sane person in his precarious, target-rich position would), looks up, sees an approaching enemy, looks down, and starts sawing much faster. It’s a subtle piece of comedy, but good for a laugh. In his more contemplative moments, B.J.’s weapon of choice is taciturn, heavy-handed mutterings, like “When I was a kid, we had a monster in our basement. My father said if I done wrong, it’d creep out at night and come for me. I tried to do no wrong. The monster came all the same.” The lesson here, obviously, is something about morlocks, American exceptionalism, psychologically abusive fathers, and lazy parables. So how many Nazis are in this world? Steadily fewer, but still more than a few too many. Wolfenstein has always embraced gratuitous violence, but The Old Blood just feels a little gratuitous.